White House 'Welcomes' House Vote On Extending Debt Limit : The Two-Way Republicans, who control the House, plan to vote Wednesday on a debt limit extension that's tied to a call on the Senate to pass a budget that includes cuts in spending. 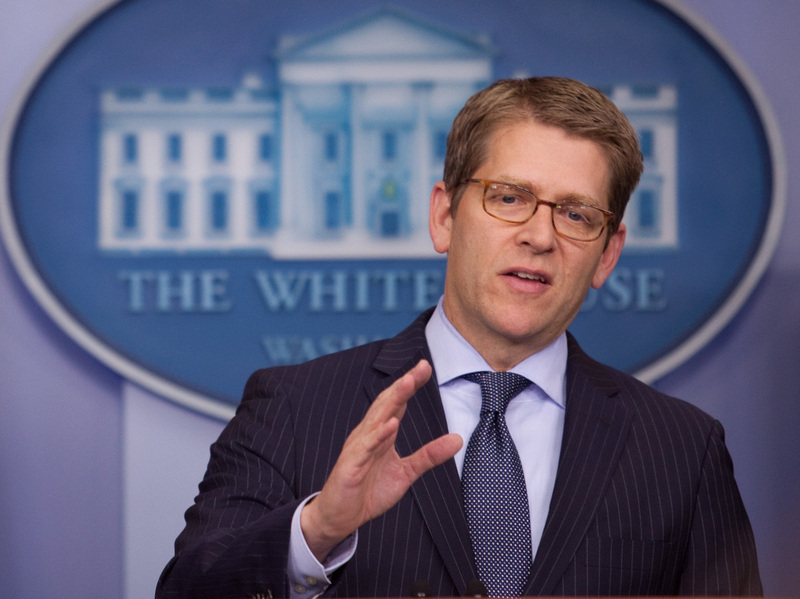 White House spokesman Jay Carney. NPR's Scott Horsley tells us that Carney also said that "House Republicans made a decision to back away from a kind of brinksmanship that was very concerning to the markets, very concerning to business, very concerning to the American people." The White House views that as a sign of progress, Carney said. As we wrote Friday, "in a move that could head off another bruising battle over increasing the nation's debt ceiling," the GOP leadership is looking to give the Treasury the OK to borrow for another three months — in the hope that will be more than enough time for the Senate to pass a budget that includes cuts in spending. The federal government is expected to hit its borrowing limit in mid-February. If either chamber of Congress doesn't pass such a budget by April 15, "pay for members of the chamber that doesn't act will be withheld and placed in an escrow account," Bloomberg News adds.